The holiday season is the season for sharing and everyone loves a good excuse to bring something yummy to the office. But what if you don’t know what to bring? Yes, we’ve all been there. It’s the night before you’re supposed to bring in a holiday treat into the office, but you’re stuck. What do you bring? Sweet? Savory? Both? Finger foods? Maybe a dip? There are so many options that you find yourself caught in a whirlwind of Pinterest ideas and thoughts of just buying something on your way into the office the next morning. But, fear not! There’s no need to settle for pre-packaged snacks or Pinterest fails that you’re too embarrassed to serve. 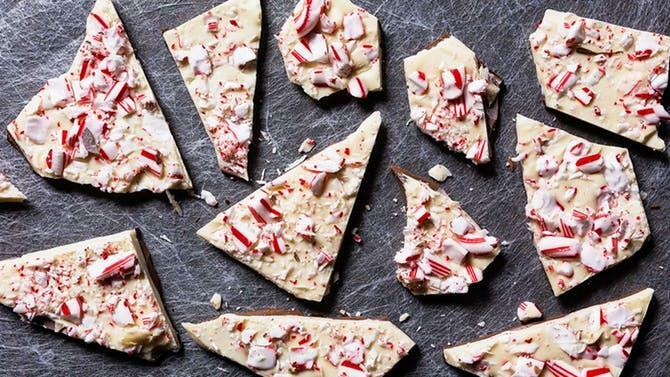 Instead, because we love our PaperDirect loyal customers, we’ve created a list of fail-proof, delicious holiday snacks that the whole office will love. In fact, be warned that you might be asked to bring these yummy snacks to events all year long! If you’re ready for comments like “Who made this?” and “It’s delicious!” – check out these recipes and be the star of the show at your office Holiday party. In a small saucepan, melt the butter, brown sugar and salt over medium-low heat, stirring continuously, until the brown sugar dissolves. Remove from the heat, whisk in the vanilla extract, and set aside to cool to room temperature. With an electric mixer on medium speed, beat the cream cheese and powdered sugar for 1 minute, until smooth and fluffy. Reduce the mixer speed to low and slowly beat in the cooled butter mixture. Increase the speed to medium and beat for 1 minute. Stir in the chocolate chips. Transfer the dip to a serving bowl and refrigerate if not serving immediately. Remove from the refrigerator 15 to 30 minutes before serving. 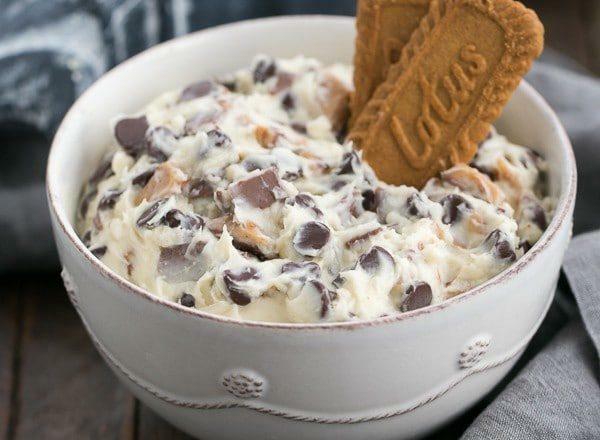 Serve with graham crackers or Nilla wafers. Leftovers can be stored in the refrigerator for up to 5 days. Place 4 cups of Chex cereal in a large bowl. In a microwave-safe bowl, combine 1 cup Red Candy Melts, 1/4 cup peanut butter and 1/2 Tbsp vegetable oil. Microwave on HIGH for 30 seconds, stir and cook in 15-second intervals until smooth. Pour melted peanut butter mixture over cereal, toss to coat. Pour coated cereal into gallon ziplock bag. Add half of the powdered sugar (3/4 cup) into ziplock bag and seal. Shake to coat cereal. Pour coated cereal onto parchment or wax paper and allow to set. 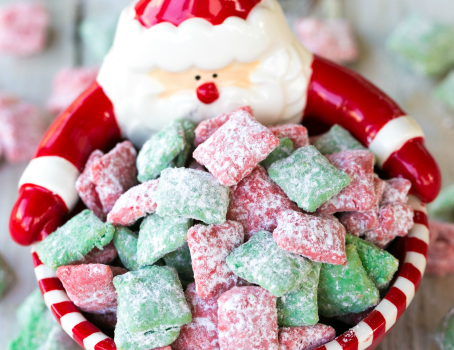 Repeat process with remaining ingredients and Green Candy Melts. If you’re still thinking to yourself that you just can’t do it… keep these tips in mind. Simple works best.The more you try to do, the more stressful it’s going to be. Not to mention, if things don’t quite work out the way you planned, you’re going to be even more bummed. Quality over quantity.Focus on making something that’s great and people won’t mind if it’s in a limited quantity. No perfection needed.If your treat doesn’t look like the picture, that’s okay. Calm your inner perfectionist and trust that it tastes delicious. It doesn’t have to be themed.Don’t worry about making things green and red, or holiday themed. If the dish is delicious, it doesn’t really matter what color it is. Bring your treat in a disposable container.Cleanup will be a breeze and you won’t freak out when you forget it at the office. Enjoy these delicious treats and remember that PaperDirect has got you covered. Happy holidays!! Win $100 Towards PaperDirect Products! 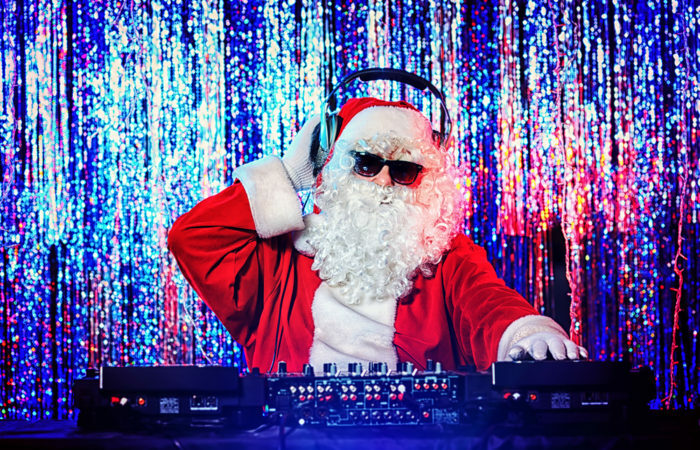 When to Start Planning Your Holiday Party. Hint: Soon!